As I've been working on my forthcoming book, tentatively titled Women of 66 and Their Contributions to the Culture of the Mother Road, two program opportunities have arisen. These two programs will be the first based on the new book (unless another opportunity arises before the second scheduled one). The first is coming up on Tuesday, March 7, at 7:00 pm, at the Missouri History Museum at Lindell and DeBaliviere in Forest Park, St. Louis. 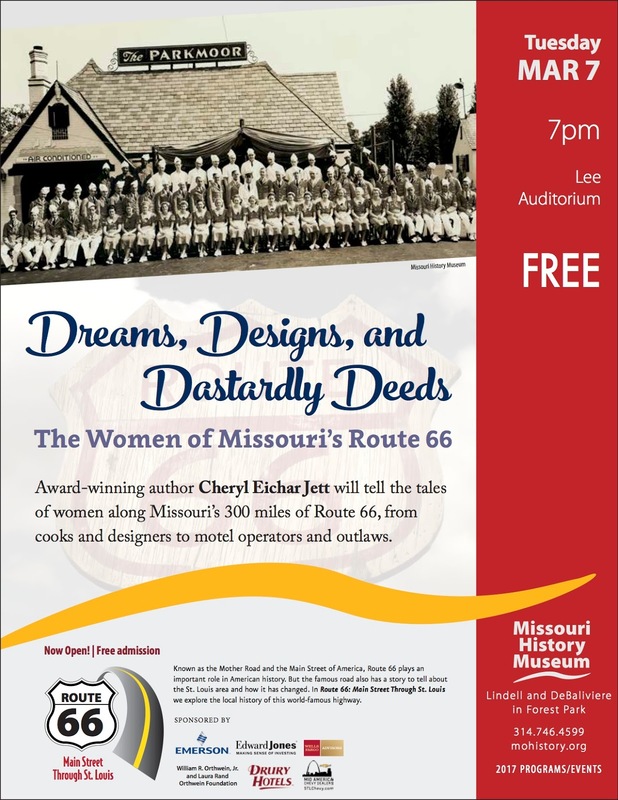 The title of the program is "Dreams, Designs, and Dastardly Deeds: The Women of Missouri Route 66." 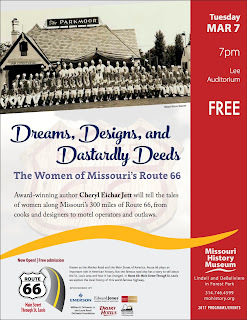 I'll share remarkable tales of some of the women along Missouri's 300 miles of Route 66. The program is free, and we'll be located in the Lee Auditorium. The second program is scheduled for Monday, October 2, at 7:00 pm, at the Macoupin County Historical Society's library at 920 W. Breckenridge St. in Carlinville, Illinois. The title of the program is "Adventurers, Crusaders, and Entrepreneurs: The Women of Illinois Route 66." In this one, I'll share some stories of the amazing women along Illinois's 300 miles of Route 66. That program, although for the Macoupin County Historical Society, is open to the public and is also free. I'm looking forward to sharing some of the 100+ stories I've collected with you at these programs.